Everyone knows that kids need to get out more often instead of being planted in front of a screen watching TV or playing video games. Ask just about any teacher and they will tell you that they are looking for new ways to get kids outside and being active. 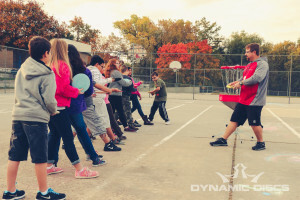 Teaching Disc Golf to kids in school is a perfect way to introduce a new activity to kids that will get them outside and get them moving. Contact a nearby school and let them know you want to teach a class about Disc Golf. Prepare an outline of what you will cover. Don’t concentrate on drives and distance. Make sure to include a Ring of Fire. Bring a portable basket and some discs. Bring putters or midrange discs as they work best for beginners. Have fun with the kids as you watch them attempt to throw discs. This entry was posted in growdiscgolf. Bookmark the permalink.